Comfy Single Family Home Within Minutes Of Everything Fort Lauderdale Offers. Enjoy the outdoors in the private backyard full of mature trees, birds, butterflies and squirrels. Covered outdoor dining and BBQ area for your enjoyment of our beautiful weather. 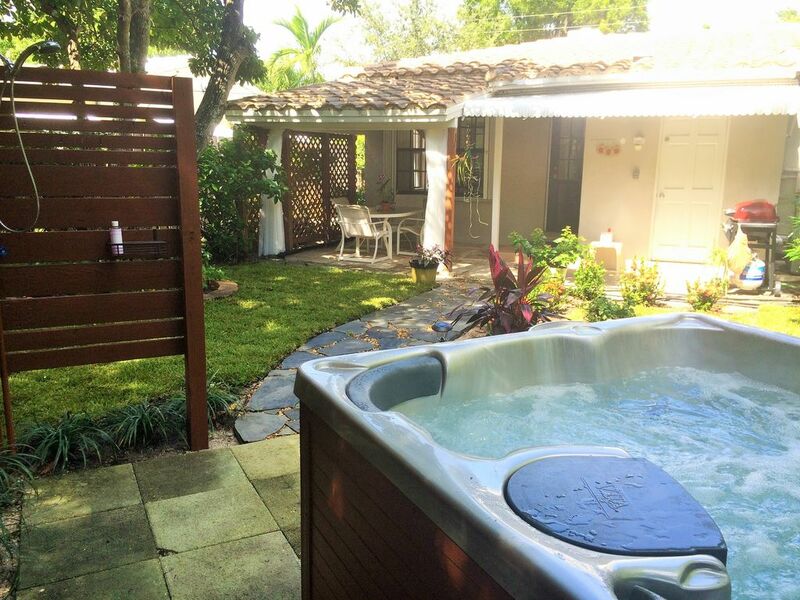 You will love lounging in the hot tub in the evening under the canopy of the Royal Poinciana, or taking an outdoor shower when the weather is warm. Brand new beds in Queen bedroom, two twin beds in 2nd bedroom and twin futon for that extra guest who always seems to show up. Full laundry and well equipped kitchen with gas stove. High speed WIFI and Smart TV with Direct TV entertainment package. City pools are just blocks away. Beach is a quick ride down 17th St Causeway - about 3 miles. River walk is about 2 miles, walk to parks. Fritz and I have lived in Fort Lauderdale since 1977. Fritz is originally from Michigan and works on boats. I am from Southern California and have been selling real estate in Fort Lauderdale for the past 30+ years. We met because of a sailboat - long story, but it's a good one! We have two children. Our son and his wife live down the street from the vacation rental. They are into computers and social work, and we live on the same street. There is always someone a phone call (or a shout) away if you need anything. Our daughter is now in D.C. working for UNICEF trying to save the world with her trips to Haiti, Nepal, Africa, etc. Everyone needs a do-gooder in the family and we are lucky to have several. When we aren't working, we enjoy cruising the waterways in our electric boat and playing with friends. We love our little bit of paradise in Croissant Park and wouldn't live anywhere else. We hope you enjoy it too. We bought this home back in 2002 because it was right next door and we figured it might be the perfect spot for one of our parents if something happened to the other. Well, mine could not live without each other and died within a month of each other just before their 60th anniversary. And Fritz's dad is a young, healthy 96 this year and loving life with his new bride. So, the place is so cute we just can't give it up. Who knows - maybe our daughter will stop traveling all over the world some day and come back home to roost next door. In the meantime, you can enjoy it! This little cottage is a prime example of the original mid-century architecture of Fort Lauderdale with modern updates. It still has the perfect Florida floor - Terrazzo, and colorful tiled bathroom. The Gate City windows are still working perfectly and the foliage is wonderful. It gives you a good feel for how things used to be. Tub/shower combo. Partially updated with retro feel intact. There is a landline for your convenience and emergency 911 calls. Assorted spices, oil, vinegar, sugar, coffee, sweetener, creamer, teas, napkins, foil, plastic wrap, baggies, filtered water, paper towels, paper plates ..... and more. Table expands to seat up to six. One child seat that attaches to table - holds up to 30 lbs. One booster seat. Children's table and stools for outside play. Quite a few books and magazines on hand. Certified Wildlife Habitat. If you love nature, you will love this yard. It even has a butterfly garden year-round and mangos in June. There is one step up coming in and one step down to get to back yard. Bathroom door is 24" wide. Within neighborhood. Adult swim with water aerobics and separate Kiddy Pool. Visitors are welcome. Fort Lauderdale International Boat Show is usually the first week in November. Winterfest Boat Parade is usually the 2nd week in December. Sunday Jazz Brunch on the New River is the first Sunday of the month. Art Walk is the last Saturday of the month in Flagler Village (3 mi). Tortuga Music Festival on the beach- April Events throughout the year - call or email for info. There were four of us that stayed in this house. It had everything we needed. We loved sitting outside in the beautiful backyard and the hot tub was great too. We found it comfortable and well decorated. We didn't get to meet Rhonda and Fritz but I guess that is a good thing in a way because we had no problems. Maybe next time. If we are in this area again we would definitely stay here again. We would love to have you stay anytime you are in town. Sorry, we missed meeting you. Next time! The backyard is what makes this cottage a great getaway! Our pups had a great time exploring it. Quiet neighborhood, great location. Close to restaurants, shops, and the beach. Anything you might need is provided and homeowners are readily available. It was nice having you. Please come again. Enjoyed my stay at this lovely home. Clean, comfortable, so many amenities. Very accommodating hosts. It was a quiet neighborhood, beautiful backyard. Recommended. Thank you. Glad you enjoyed your visit. Come again. Comfortable stay for our family with two young children. The home is very neat and had everything that we needed, and is about a 10 minute drive from the beach. We love returning guests. Hope to see you next year! This is our own vacation rental and we had family visiting. Nice time had by all. Perfect spot for a Ft Lauderdale getaway! This house was perfect for us. We were here on business, exhibiting at the Tortuga Music Festival, and the House was close to our location as well as everything else we needed. Since we were working we didn’t have too much free time, but coming back to the hot tub after long days on our feet was wonderful! The hosts were great and the House has everything you need! Will be back! Croissant Park is a quiet residential neighborhood in the shadow of downtown. Minutes to beach, airport, Riverwalk, Broward Health, Performing Arts Center, parks, museums, restaurants, Las Olas Shops, Lauderdale Marine Center, Convention Center, Maritime Professional Training Center, neighborhood pools, I-95 & I-595. This location puts everything in Fort Lauderdale within easy reach.